Although he achieved fame early in his career and maintained a certain level of popularity during his lifetime, the majority of music by French composer Benjamin Godard has not retained its place in the repertoire. Nonetheless, his Suite de trois morceaux (“Suite of Three Pieces”), is still immensely popular among flutists. 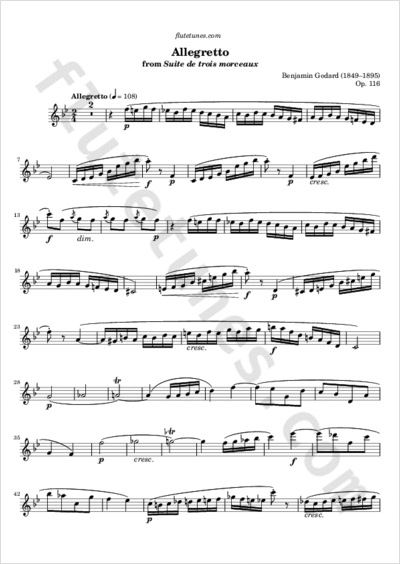 Composed in 1890 for the great French flutist Paul Taffanel, it is a short work in three movements: “Allegretto”, “Idylle” and “Valse”. Today we present the first of these movements, which is characterized by a fast-flowing theme that makes an excellent finger exercise. James Galway made a wonderful recording of this particular piece.